A hotspot, to explain, is the idea of detaining arriving migrants and refugees at one spot for processing, the hotspot RIC (Reception and Identification Centre). It is another instrument to add to a growing collection for a common European asylum policy. But that is a myth, for the common policy is only called upon when it serves the purpose of reactionary politics. After that the policy is thrown to internal wrangling between EU member states. Thus, far from advancing a common policy, the hotspot only adds to its ongoing theatre of dis-coordination. The hotspot becomes a migration choke, a new mechanism of detention and a way to ensure that those who escape to Europe from one disaster zone end up in another. This then becomes a measure of its “success”. 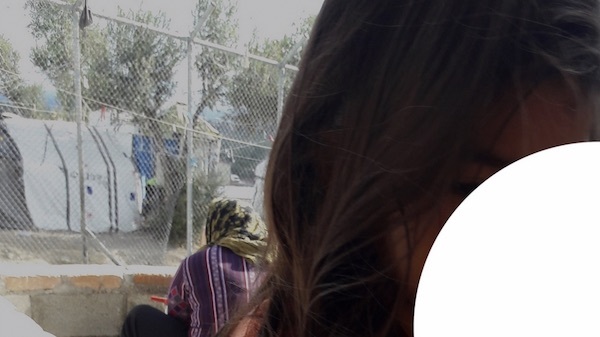 This essay is not about the inevitability of conditions at hotspot Lesbos but to provide another understanding through a reading of its three years at Lesbos. These show how the means of the hotspot use the values of the humanitarian and civil agency to establish its ends. European Commission documents, dated December 2017, reveal how 481 million Euros have been allocated to UN agencies and NGOs active in Greece, … key recipients among the NGOs are the Danish Refugee Council, the International Federation of Red Cross and Red Crescent Societies, the IRC, and Oxfam. In addition, independent entities like the International Rescue Committee (IRC), “with annual operating revenues approaching 740 million USD, swept in to erect camps and other forms of infrastructure across the island.” This Lesbos was a stage for large scale guerilla interventions alongside “celebrity advocacy” that enabled “humanitarian players to effectively exploit and couple market logics with the theatrics of disaster”. It flowed with the endless arrival of refugees, the faces by the thousands, a few plucked out for media attention, but for most the extras for a humanitarian tragedy . In parallel to this was another mass, the mass of the people of ordinary means, both islanders and volunteers across Europe who poured into Lesbos in 2015 – Lesbos as the concentration of people to people solidarity. It is in those terms that Katharyne Mitchell and Matthew Sparke (2018) in Space and Society could read Lesbos as a convergence of the geosocial and geopolitical – ‘geosocial solidarity’ as a form of politics that acts in counterbalance to the geopolitical agency of the state. However if the political ramifications of geosocial solidarity could lie in its capacity to effect strategy through a critical mass, that avenue was both a target and subject of the hotspot. With the hotspot came the powers to close the camp gates, enforce registration. And for solidarity, processes to filter out unaccredited or autonomous civil intervention. Against this hard power, the resilience of autonomous spaces that Mitchell and Sparke refer to, came to signify two things – firstly the durability of the geosocial counter-practice as a way of refusing to abandon, witnessing, presencing, being with, and secondly, its place in an evolution or establishment of a ‘hotspot life’ (even in its perversity of thought). Hotspot life implies no imposition nor any capacity of resistance but it is what emerges at the hotspot; the making of a form of sociality bound with a humanitarian gel. The casual visitor to Lesbos can partake of it around Mytilene, the picturesque port town with its bar and café culture. This is not to suggest that hotspot life is Lesbos life; instead it is self segregating and leaves most of Lesbos untouched. A defining aspect of hotspot life is that it always seems to ask “so how long will this last?” But the answer is open-ended; for as it evolves, it becomes socially sustainable as a hotspot economy. Through that, hotspot life pervades Lesbos though the financial realities that underpin it also gel the subject positions in it. Thus hotspot life is a highly distinct form of sociality with migrants and refugees, humanitarian staff, volunteers, EU officials posted to Lesbos, security personnel, local businesses employees but it is not a social melting pot; in fact, in its establishment, the more it becomes sustainable, the more it becomes a routinised form of ‘Othering’. 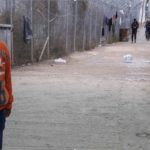 For the thousands held in ‘open-detention’ in the hotspot, the reality of hotspot life is constrained to a few points between Moria and Mytilene, at times at ngos with highly evocative names that reflect the sociality. 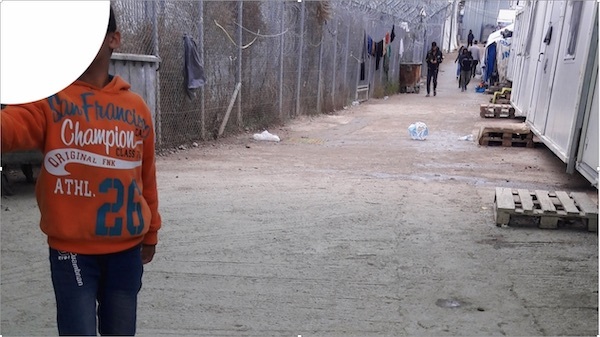 But for the detained, the overwhelming fact of hotspot life, and that applies to an increasing proportion of children according to Unicef figures, is the condition of being contained in a limbo living in inhumane conditions. It may be possible to ameliorate the latter – and that becomes a raison d’etre – but no amount of humanisation of a hotspot can disguise what it has turned into. So at first there was the imaginary of Lesbos as an open island, an unlimited outpouring of humanity that then became a hotspot prison island. The October 2015 hotspot designation of Lesbos was followed within 6 months by the EU-Turkey deal. The latter completed the hotspot operationally with its basis tenets clearly laid out by the EU Commision Press Release. Hence on, Turkey was obliged not only to prevent irregular departures to Lesbos but all who arrived at the hotspot, unless eligible for protection and asylum, would remain in it for return to Turkey. The EU-Turkey deal turned Lesbos into a human bottleneck paid for by the EU. To the prior commitments by the European Commission of an estimated €1.8 billion to Greece for 2014-2020 (EC data) was added the two instalments of €3 billion to be paid to Turkey for 2016-2019 (EC data). These have been shored up by additional performance related payments to Greece to consolidate the hotspot as its humanitarian toll made it vulnerable to political challenge. In April 2018 another €180 million was announced. These vast amounts have come to bear on both state and civil agency, on the left and on the right, but brings with it inevitable forms of protectionism and turf management within a tiny geographic enclave. The hotspot and its large commitments came with the undeclared ‘state of emergency’ of 2015 and its million Syrian refugees. It was not to help them per se but to halt the collapse of the keystone of EU’s asylum policy, the Dublin Regulation following its suspension by Germany on 21 August 2015 (Angela Merkel’s ‘we can do this’, Wir schaffen das, in accepting the Syrians who had arrived there). In brief, Dublin is based on the principle that every migrant-refugee must register his/her asylum claim at the first safe country of arrival. Whilst this ‘logic of Dublin’ was ceaselessly promoted by EU states to naturalise its thinking socially, then used by its populist parties, Dublin stands outside any UN regulation (for every sovereign state is free to exercise its own asylum policy in line with UN conventions). Given the disparities, divisions and discord between EU states, Dublin proved unworkable though subject to 3 major revisions since 1990. Many a time it has been suspended by individual EU member states. However in October 2015, in a climate of crisis and rare unanimity – that ‘something must be done now!’ came the hotspot. In essence the hotspot was a lock-down (to Dublin, enforcing registration and finger printing for the common EU database Eurodac). But human rights issues aside, the hotspot also locked Europe’s migration policy onto an even narrower path whilst pushing the divisions between EU states on migration further apart. If the hotspot was to enable an unified migration policy based on a fair allocation of migrant numbers across Europe, that has turned into a farce as never before. The process of helping the front-line states (Italy, Greece) who bear the brunt of numbers is hostage (to other EU states). Some still refuse to accept any quota. According to data from European Migration Law only 34,689 of the projected 98,255 asylum seekers (figures April 2018) have been relocated from the hotspots under the commitments made when it came into effect. The consequence is a new disaster that was always inevitable. But in three years we have gone from that scramble for a humanitarian market at Lesbos in what Anja Franck could describe as “the state’s withdrawal from key functions” to a fundamentally different situation of a hotspot managed lock-down – for far more people than intended and for far longer. The Lesbos RIC, Moria, for instance was meant for 3000 but now holds two, at times three times that number, some for over two years. In this passage from the heroic theatrics of arrivals and departures to the dire conditions of mass detention, the collective trauma has only increased but the days of celebrity advocacy are over. But far more significant is how the question of the hotspot’s legitimacy, as an instrument, has been defused within the island. This lies in how the political strategy of hotspot Lesbos quietly went through a change from hard power onto soft power. Soft power is about accommodation, both of the agency of civil solidarity and of reactionary populism as a way of normalising the hotspot. Just as the social durability of the hotspot depends on a sociality, soft power is key to its enmeshing. It is not to suggest soft power may be benign. Instead soft power subverts solidarity, sedates suffering and suffocates dissent. By its means, it is not that the social agency of solidarity is recuperated but that its terrain of operation fundamentally changed to effect the same within a remote hotspot island. That the hotspot does not clash with the moral order of the society in which it has to function, that it is seen to uphold the order. That in its process of implementation, it slowly ceases to be a space of exception but through the civil humanitarian dimension becomes socially sustainable. Challenge 3: Be a fait accompli. That the hotspot can not be turned back, rolled back or revoked through political or legal challenge. Exclusion here works to maintain a liberal Europe through the effective management of disaster and an externalisation of responsibility”, the “hotspot approach also intervenes at the level of European society, working to mould the concerns of citizens into effective tools of governing and liberal order. The hotspot thus effects a managerial-ism of civil agency that “bring order to the compassion of volunteers and make it work effectively for liberal sovereignty rather than against it”. The capacity to protect the rights of those who seek asylum comes out of this prerequisite. In addition representatives of Frontex have held regular meetings with volunteer rescuers who have worked to create many of the hotspot satellite sites and form part of what has been termed a humanitarian borderscape … These meetings work to bring such concerns for life performed by these volunteer rescuers under the regulation and control of liberal sovereignty. Frontex is the European Border and Coast Guard Agency, established in 2005 and based in Warsaw. Its operating budget rose from € 19 million in 2006, to €118 million in 2011, then €232 million in 2016 and is now the most financed European agency, €302 million in 2017 (data from Frontexit). EASO, the European Asylum Support Office, based in Malta was established in 2011 to increase cooperation on asylum between EU member states and support its ‘frontline’ member states. EASO’s budget has increased almost tenfold between 2012 and 2017 (EC source) and is expected to grow further from €86.97 million in 2017 to over €114.10 million by 2020 (EC statement). Humanitarian aid is provided through humanitarian organisations to create and maintain the impression that humanitarian assistance is distant from state interests, even while humanitarianism is reliant on the sovereign permission of states to operate and much of the aid distributed is state funded. But of course the state here means the greater state; or the state here is a function of pan-European agency. That a syncretism of state power in the making of a hotspot now lies outside of our representative political institutions, which is its uncontested even uncontestable dimension. Yet at the same, the hotspot projects a devolution of agency (and thus responsibility). The lessons of Lesbos lie in how the hotspot has become a new form of power, a headless hydra whose means tie us to its ends by an expropriation of humanitarian values. We can look through the Frontex website for instance to see just one part of it transparently; where the projected words are of ‘saving’, ‘helping’ and so forth. What is cut out of the picture to meet the objective of numbers is not only the reality of the outsourcing to Turkey (easily done) but also the hotspot itself which far from being the means to an unified European migration policy has only created more division and increased suffering. It is always that the humanitarian dispensation is to address suffering without condition but Lesbos is a case study of an entrapment through stages. Over three years the wheels have turned almost imperceptibly squeezing out unaccredited social agency through the harmonisation of accredited ngos which even in any dissenting capacity are contained in a common purpose at the hotspot (to the alleviation of the misery within it). By its establishment, the result is the parallel making of a sociality that sustains its ends – hotspot life. A paradox of life of course in which the greater the concentration of funds and humanitarian agency, the further it evolves, the greater the concentration and sedation of human suffering and the space of its toleration. I read this article and found it very interesting, thought it might be something for you. 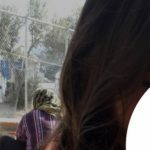 The article is called Soft Power and Hotspot Life: The Lessons of Lesbos 2015–18 and is located at http://criticallegalthinking.com/2019/01/28/soft-power-and-hotspot-life-the-lessons-of-lesbos-2015-18/. ← Are some feminists asking the wrong question about who counts as a “lesbian”?